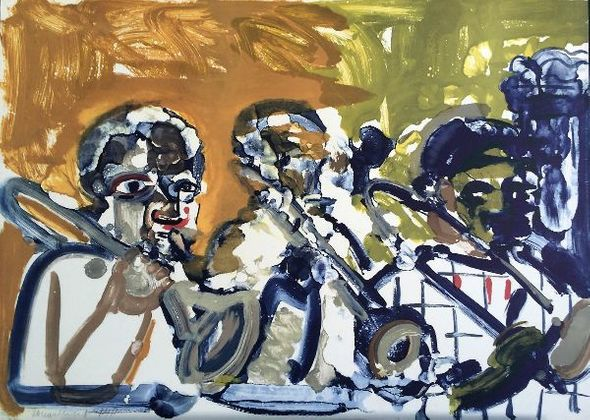 Romare Bearden Signed Limited Edition Print on Paper:"Brass Section (Jamming At Minton's), 1979"
Edition: Signed and Numbered Limited with a certificate of authenticity. About the Artist: Romare Bearden was an African-American artist. He worked with many types of media including cartoons, oils and collages. Born in Charlotte, North Carolina, educated in Pittsburgh, Pennsylvania, Bearden moved to New York City after high school and went on to graduate from NYU in 1935. He began his artistic career creating scenes of the American South. Later, he endeavored to express the humanity he felt was lacking in the world after his experience in the US Army during World War II on the European front. He later returned to Paris in 1950 and studied Art History and Philosophy at the Sorbonne in 1950. Bearden's early work focused on unity and cooperation within the African-American community. After a period during the 1950s when he painted more abstractly, this theme reemerged in his collage works of the 1960s, when Bearden became a founding member of the Harlem-based art group known as The Spiral, formed to discuss the responsibility of the African-American artist in the struggle for civil rights. The New York Times called Bearden "one of America's pre-eminent artists" and "the nation's foremost collagist."